Today, Latvia’s ABLV Bank—its third largest, and largest private bank—announced that it had received approval from the Council of Financial and Capital Market Commission (FCMC) to liquidate, and that the Bank was proceeding with the process of liquidation. The proximate cause was the U.S. Treasury. It invoked Section 311 of the USA Patriot Act on February 13th, asserting that the ABLV had an “institutionalized money-laundering” problem, including sanction-busting transactions with North Korea. This spelled a death sentence for the ABLV. In the period 2008- 15, four major money laundering cases that involved some Latvian banks were revealed. The cases have been thoroughly investigated, and serious punishments, including the revocation of two bank licenses and multiple million-euro fines have been imposed. The Latvian authorities have carried out all conceivable measures to put an end to all money laundering. They have adopted all desired legislation and the consensus judgment is that implementation has become firm since 2015. In 2004, Latvia became a member of the European Union (EU), after having adopted extensive EU legislation. In 2005, it started cooperating with the US Treasury Financial Crimes Enforcement Network, and the US Treasury has been a driving force in AML/CTF endeavors. The main effort was undertaken from 2014 to 2016. In January 2014, Latvia adopted the euro and become a member of the Eurozone as well as the European Banking Union, being supervised by the European Central Bank (ECB). In November 2014, the ECB established the Single Supervision Mechanism (SSM) for banks in the European Union, which became operational on January 1, 2016. The ECB supervises the three biggest Latvian banks, while the other Latvian banks are supervised by the Latvian FCMC in cooperation with the ECB. As far as the ABLV’s financials are concerned, I used Texas Ratio diagnostics to determine the Bank’s soundness. This Ratio was used during the U.S. Savings and Loan Crisis, which was centered in Texas. The Texas Ratio is the book value of all non-performing assets divided by equity capital plus loan-loss reserves. Only tangible equity capital is included in the denominator. Intangible capital — like goodwill — is excluded. The ratio measures the likelihood of failure by comparing a bank’s bad assets with its available provisions for bad loans plus its capital. When the ratio exceeds 100%, a bank does not have the capacity to absorb its losses from troubled assets. In consequence, it will either require a fresh capital injection, or it will fail. 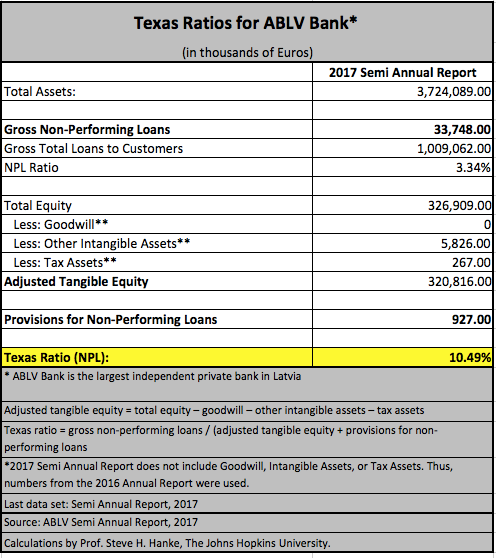 The table below presents the ABLV’s Texas Ratio, which is based on the Bank’s most recent quarterly report (as of 30 June 2017). The ABLV’s Texas Ratio is rather low, indicating strength, not weakness. Indeed, the financials do not give so much as a whiff of liquidation. We [UST] realized that private-sector actors—most importantly, the banks—could drive the isolation of rogue entities more effectively than governments—based principally on their own interests and desires to avoid unnecessary business and reputational risks. To give this idea teeth, the UST’s Office of Foreign Assets Control (OFAC), which is responsible for all sanctions programs, has the ability to target and sanction violators with asset freezes and fines. Even a threat can spell a death warrant for the soundest of banks—as Latvia’s ABLV Bank learned. There are other lessons to be learned from this episode, too. There are few restraints on the UST’s war machine. Once the bureaucrats at the UST take aim, they can destroy institutions and reputations without the designated targets ever having their day before a judge and jury. That is, indeed, a lesson worth pondering.